Title: 'Insulae Malta Accuratissima Delineata Urbibus et Fortalitiis'. An attractive map of Malta and part of the African coastline including Tunis and Tripoli that was published during the "golden age" of Dutch cartography by Frederick De Wit. The map has a decorative title cartouche and an inset plan of Valetta with a lettered and numbered key. De Wit (1610-1698) was a prolific Dutch engraver and publisher, active in Amsterdam during the second half of the seventeenth century. 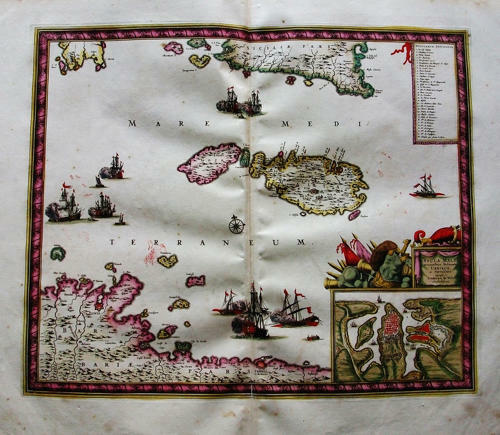 He acquired a number of copperplates from the sale of the Blaeu and Jansson stocks to supplement his pwn plates, thus having a stock of about four hundred maps. De Wit's own maps are noted for the fine standard of engraving, and are invariably well designed and decorative. They were very popular amongst his contemporaries, being reprinted many times both by himself and his successors, the Mortiers. In very good condition with vibrant original colour. Minor margin toning and a few margin spots.